Ahmose became the first king in the New Kingdom. He starts off the 18th dynasty by defeating the Hyksos , reuniting the torn apart Egypt. The 18th dynasty had 13 kings and 1 outstanding Queen. Some of the well known kings are Ahmose 1, Thutmose 3, Amenhotep 3, Akenaten and his wife Nefertiti. This outstanding Queen was named Hatshepsut. As this quote says, Hatshepsut was an amazing Pharaoh with extraordinary talents of ruling under incredible pressure. During her reign she accomplished many things including building her own Burial Chamber and many Obelisques. 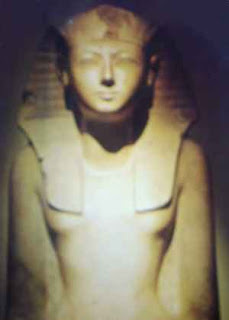 Hatshepsut was the first and only successful woman pharoah. The first King of the 19th dynasty was Ramasese I. He moved the capital from Thebes to Memphis. There was 7 other Pharoahs after Ramases I dies. Ramases restored numerous monuments and he built himself a beautiful temple. Ramases II, his son, was the most well known king of this dynasty though. Ramases III was the last great king of the New Kingdom. He was the greatest king of the 20th dynasty as well. He built a temple for himself in a large royal area. The 20th dynasty withheld one of the greatest Pharaohs of all time. In conclusion, the New Kingdom began after the Hyksos invasion and finished with a marvelous leader. During the New Kingdom the only successful woman Pharaoh rules. The New Kingdom was a very interesting and successful time period of Egyptian History.